Green Sand Beach, otherwise called Papakōlea Beach is a beach located near South Point, in one of the districts of the Big Island of Hawaii. It is famous for being, as the name clearly states, a beach with green sand, actually one of four total green sand beaches in the world. Since it is quite unique, we thought we would explore what makes this beach green, why it is so special, how you can reach it, and what you can do while you’re there. Let’s have a look! Why the Green Sand Beach? The name of the beach comes from the color of its sand, which is olive green due to the eruptions of what was once a volcano. This beach is actually situated within a cinder cone which only has three sides now. The fourth side is the one from which the ocean is now coming, namely the eastern one. The olivine crystals are the ones that make the sand green. They appeared when the volcano erupted years ago. Now, the volcano is dormant. Olivine is also a semi-precious stone that surrounds this bay. The waves turn the stone into fine sand as they constantly crush against it. Even though the green sand becomes so fine that we cannot use it as a gem stone anymore, if you think about it, you are stepping on jewels whenever you walk across Green Sand Beach. How Can I Reach Green Sand Beach? Reaching Green Sand Beach is definitely not easy. First of all, you have to drive around 2 and a half hours from any resort you might be staying at along the Kohola Coast. However, you cannot actually drive until you reach the beach, only until you reach South Point. And you can only do that if you are a very experienced off road driver that knows the area. Otherwise, the terrain is wild, undeveloped, and too dangerous for you to explore by car. Another way for you to reach Green Sand Beach is to hike. This is what most people choose to do anyway. The hike is three miles long, so you should prepare yourself for quite a journey. Moreover, you have to make that journey through lava fields. Don’t worry, this is not dangerous. The volcano is dormant and it can actually make for quite a view. Once you reach the beach area, you also have to think about how you’re going to get down to the actual beach. Its bowl shape forces you to climb on the side of it. This may sound quite dangerous, but if you proceed with caution, nothing bad will happen to you. And we guarantee that the view is worth it. But we’re going to talk about that later on. Now, we want to provide you with some tips in order for you to be fully prepared for the hike. First of all, if you have decided to hike to Green Sand Beach and it is a really sunny day, you should remember to cover your head and bring plenty of drinking water. Also, you should know that the wind tends to blow quite furiously, which blows the dust up. The weather can be quite humid at times too, and it is definitely hot, so you shouldn’t forget about sunscreen. The area doesn’t have any facilities either, so you will have to brave the elements with no extra help. Remember that this trip will take an entire day, during which you will be hiking for about 3 hours. You might be hiking even longer if you are not used to it. Also, don’t linger on the beach until it gets dark. It might be really difficult for you to find your way back with no lights and through an undeveloped area. Since you are going to be hiking for a while, the best thing you can do is wear hiking boots and generally comfortable clothes. We would suggest a t-shirt and shorts. Always bring a hat as well, since it will protect you from both the sun and the wind. Also, since you can swim there, you might want to take a backpack with you that contains swimming gear. 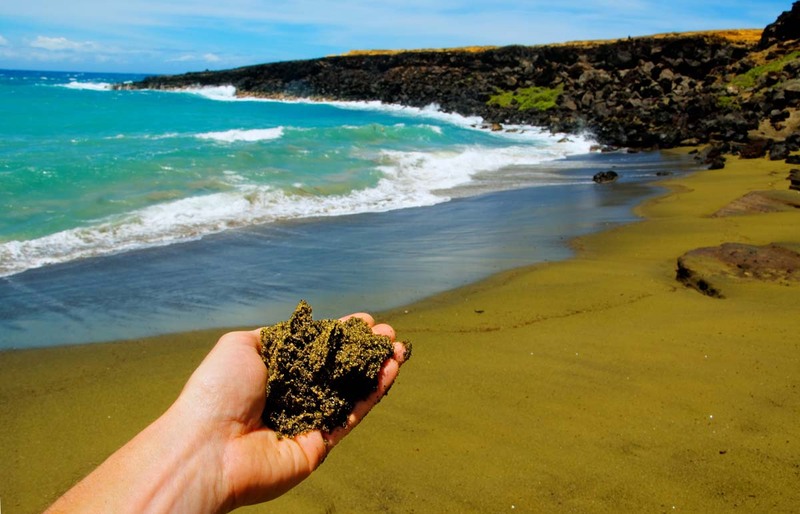 We should mention that there is no specific trail that you can follow to Green Sand Beach. There isn’t a map that you can use either, or any kind of markers or signs. So you are pretty much on your own, but this shouldn’t scare you. Is the Difficult Road Worth It? The answer is definitely yes. Even though the road can be difficult and challenging at times, you will absolutely find it worth it in the end. Even on the road to Green Sand Beach you have interesting things to see. For instance, there are multiple ancient heiaus for fishing. There, the old Hawaiian population used to offer their capture to the gods. Once your reach the beach, it will become clear to you that this is one of the most gorgeous views on the island. The beach almost looks like something taken from a fairytale, with its olive green color and steep cliffs that surround it. If you are lucky enough to catch the sunset here, you will be amazed by the combination of colors that are truly breathtaking. Not to mention the appeal the intensely blue water has. You can swim there, but beware of the currents, since they can be quite strong. If you notice the water is especially turbulent, it would be better for you not to go swimming. Just admire the view and take a small dip in the water. Even if the currents are not that strong and you decide to go for a swim, we advise you to stay close to shore for your safety. Remember that the beach has no lifeguards to come to your rescue. Other than that, if you take all the precautions you need and follow our advice, you will definitely have an amazing time visiting Green Sand Beach. You can simply imagine how it feels to swim in the cinder cone of an ancient volcano while being surrounded by clear blue water and green sand, and you will understand the appeal.